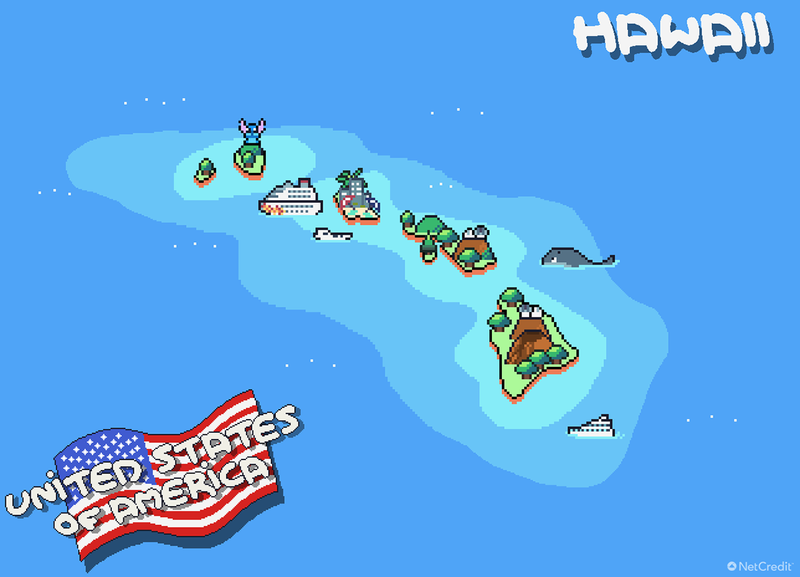 Do you remember 8-bit Google Maps? You don’t have to be an ‘80s kid to recall that colorful ‘Nintendo’ product: it was a (rather useful) April Fools prank pulled by Google as recently as 2012. But joke or not, people loved it. There’s a beauty to 8-bit graphics that goes beyond nostalgia. And maps, well – they have a beauty of their own. Put the two together and you have, quite simply, the world in miniature. The actual cartridge may never have made it to your NES console. But the online version of Google’s blocky graphics map proved an endless source of enjoyment for geeks and orienteers alike. And true gamers are still discovering ‘Easter eggs’ in Google’s retro maps today. 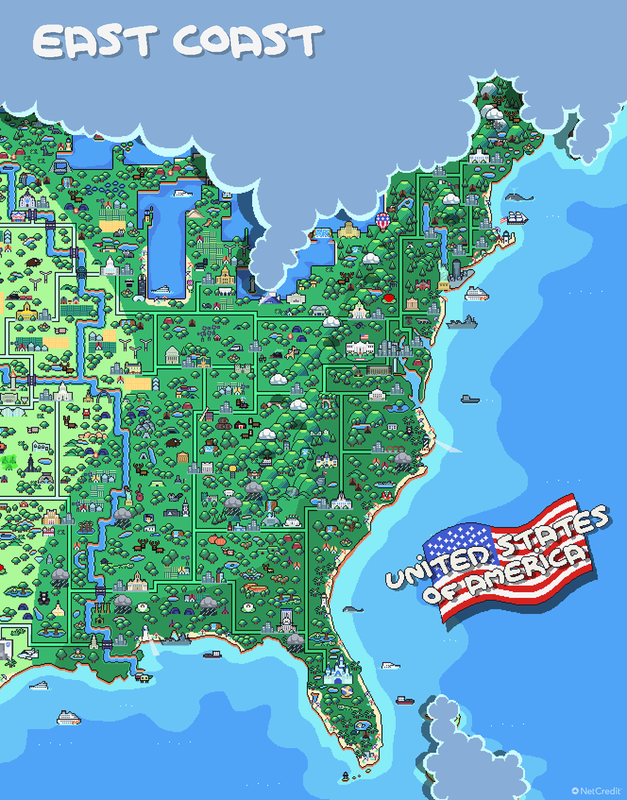 We decided the United States needed its own dedicated 8-bit atlas, featuring the most important natural and tourist attractions, rivers and mountain ranges of the country. So we made one. Because satellite view is too realistic, right? No tour across the America’s wild west is complete without meeting with some very extraordinary bison. Wyoming’s Yellowstone Park is brimming with them. But can you hop, Mario-style, over them without landing in the springs? The Grand Canyon is another of the west’s awesome places of natural beauty – even rendered in miniature. But the west isn’t all wild anymore. 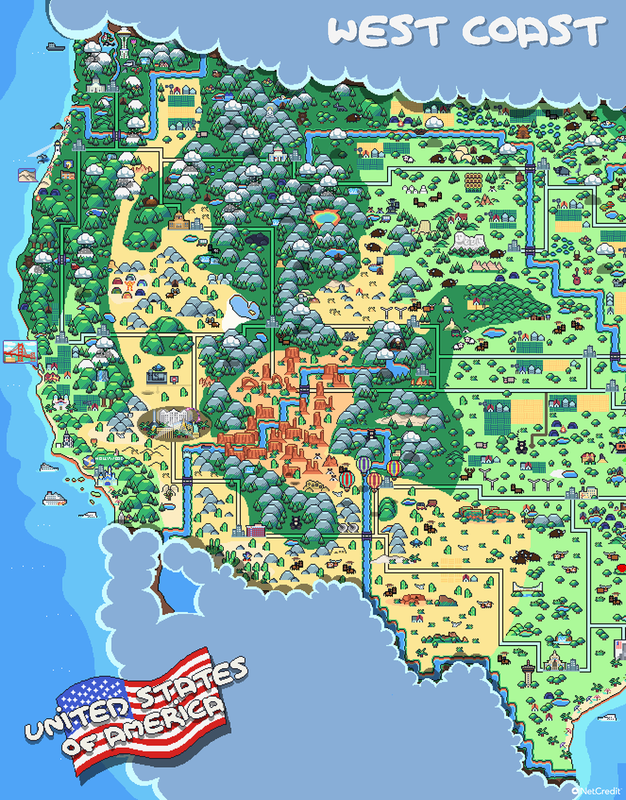 The Golden Gate Bridge and Mount Rushmore are among symbols of modern civilization that take pride of place on our 8-bit map. It’s all a little greener and less deserty out east. But the Statue of Liberty remains a shining beacon for those in New York – and Disneyland echoes the sentiment further south. Make your way to Memphis, though, and you could be in for an encounter with a local of note. Yes, Elvis sightings are even being reported in 8-bit America! 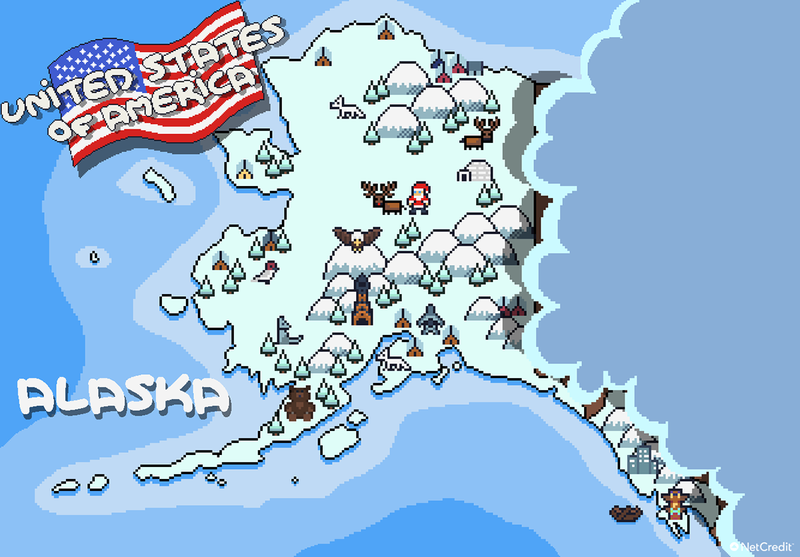 And who’s that character in the red hat hanging out up in Alaska? He soars like that bald eagle, he’s soft and cuddly like Alaska’s famous Kodiak bears. But whether Santa is a goodie or an end-of-level boss, you’ll need to get closer to tell. There are some video game worlds that make you just want to forget about the action and explore, or stand in awe at the wonder of (blocky graphics-) nature. Our Hawaii map is just one of those: watch volcanoes smoking from a safe distance, or have a ‘moment’ with the spinner dolphins and monk seals of Kīlauea Point National Wildlife Refuge. The romance of 8-bit graphics can brighten up the darkest of days. 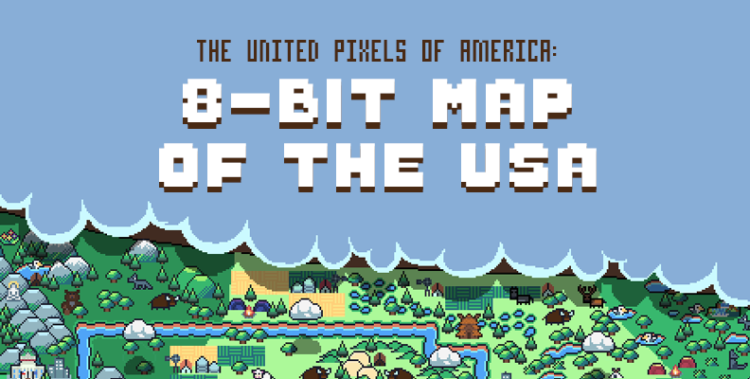 And like the best Nintendo games, an 8-bit map is both a puzzle and a thrill. Where will your joypad take you next? We researched the most popular tourist destinations across the country and chose a diverse combination of experiences and attractions. We made sure to have an even geographical spread including attractions in each of the most visited cities in the country. The nation’s wild animals were selected based on those that are best-known, as well as geographical spread. Our map features all the major rivers, mountain ranges and key ecoregions of the country.